Lose fat, get fit and transform your body fast with world powerlifting AND world bodybuilding natural champion personal trainer with 20 years experience. RESULTS guaranteed! I'm a personal trainer in Leeds with vast experience dedicated to helping you reach your health and fitness goals. I've regularly competed internationally and represented Great Britain in both bodybuilding and powerlifting competitions and I'm currently the World Pro natural bodybuilding and World Powerlifting champion. This focus, discipline and know-how has been utilised to help my numerous clients achieve their fat loss, contest prep, fitness and body transformation goals. Why risk training with someone less knowledgeable? If you want guaranteed results, then don't gamble who you train with....experience, attention to detail and a great track record of transforming bodies really does make the difference! I have an excellent success rate with clients from all fitness levels, ages and body types. From getting a client to lose 15 pounds of fat in just 4 weeks to ensuring several clients who struggled to gain muscle over the years - put on over 1/2 stone of muscle in less than a month! Whether you wish to lose fat, tone, build muscle, strength train or work around stubborn injuries, my unique training will encompass the best of resistance exercises to sculpt your body, specialised cardiovascular workouts to help burn the fat quickly and the latest nutritional and supplement advice to aid these goals. Are you a gym novice, been training for a while without getting results or just lacking in motivation to train yourself? Let me help you to reach your goals quickly with my tried and tested formula towards training, dieting and supplementation. 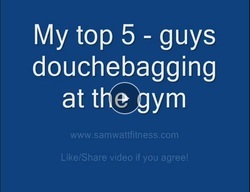 VIDEO: My top 5 - Guys douchebagging at the gym! VIDEO: My top 5 - Ineffectual female exercises!